Some people will tell you that there isn’t any true wilderness left in the UK. Which really just begs the question of what wilderness is anyway? To some it means an area in which there are no signs of human impact whatsoever, while dictionaries and Wikipedia are a bit more relaxed and suggest its defined by a lack of roads, industry and habitation. However, I have another – very 21st century – suggestion to make. How about an area in which an epic, Alps-worthy big mountain descent has not been designated as a section on Strava? 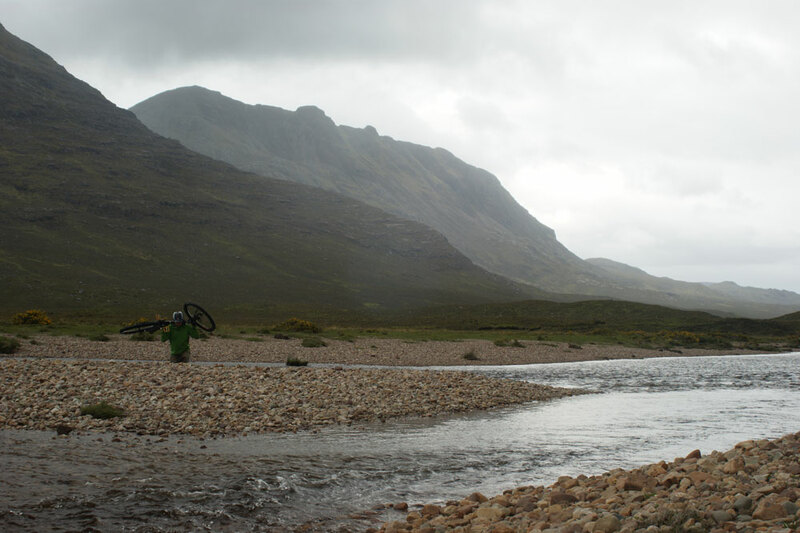 Believe it or not, that’s exactly what we found as we spent a day crossing “the great wilderness” in Scotland’s North West Highlands – an epic 39km point-to-point route which included lengthy hike-a-bikes, technical descents and river crossings. I’m sure the wilderness was supposed to be around here somewhere. 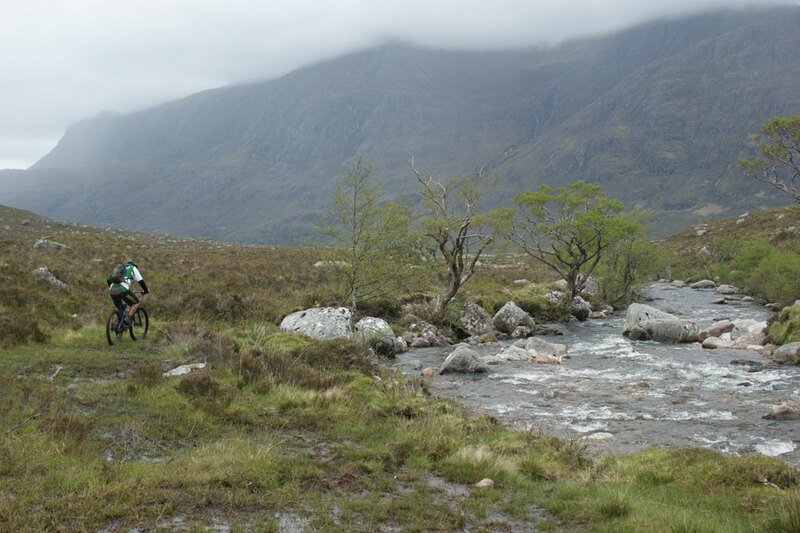 I’d first heard about the ride a year before as we sat in Torridon Youth Hostel planning our week’s riding and my pal Chris floated the idea of this ride – explaining that he’d ridden a bit from either end but wanted to try to link it up. It sounded awesome, but logistics prevented us from tackling it at the time – and it wasn’t until this Spring that it appeared on our radar again. 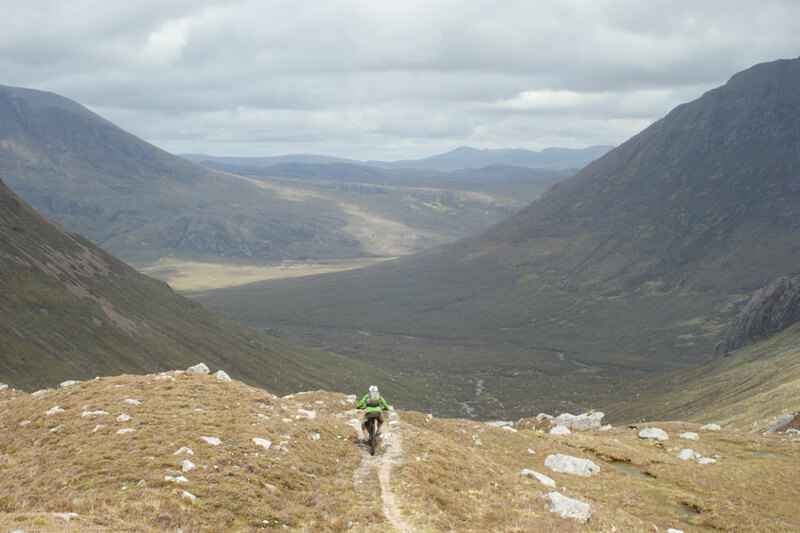 Job woes had forced me to pull out of a planned Trans Provence trip, so a June week in the NW Highlands was going to become my main biking trip for the year – and I readily agreed when Chris floated the idea again. 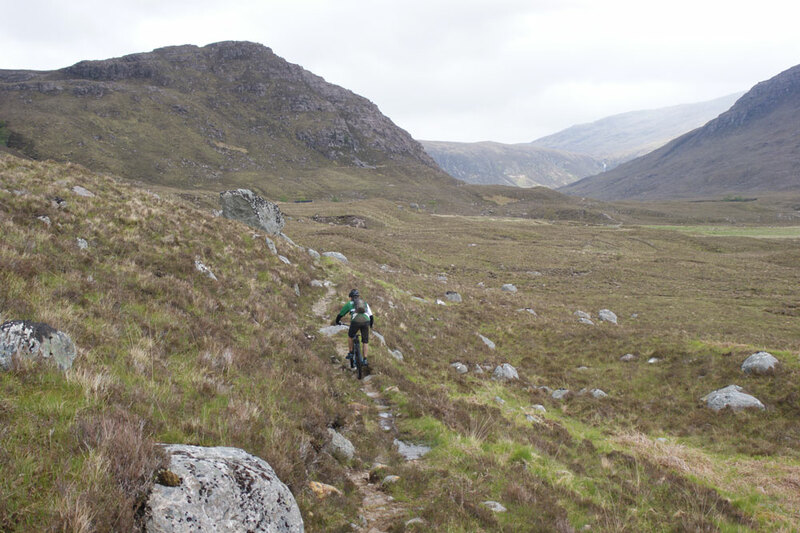 Alternately known as the Fisherfield Forest or the Letterewe Forest (despite a conspicuous lack of tree cover), the area we were to cover lay between Poolewe and Dundonnell – with two big passes, river crossings, and a trackless bog to traverse “between trails”. With the long days of June made even longer by our northerly location, we could afford to get the day off to a relaxed start – and it was mid-morning as we drove up from the SYHA hostel at Ullapool. There are stunning views round every turn in this part of the world, and it’s easy to get a bit blasé about ANOTHER stunning vista appearing in your windscreen. But even so my first glimpse of An Teallach as the steep road up toward Dundonnell began to level out was stirring. The mighty mountain’s impressive twin grey buttresses seemed to loom way above the road – and while I’m not one for omens, I did get a bit of a shiver as I saw an eagle glide lazily out from the mountain – presumably scanning below for prey. It’s the only time I’ve seen one of these birds in flight and I was taken aback by its sheer size. I also wondered whether it might be watching us later in the day when we returned over the flank of the mountain from the other direction on two wheels. After quickly dropping one of our vans in the layby at Dundonnell, we continued on our way to Poolewe in the other vehicle to start the ride. The great thing about many of the trails up in this part of the world is that there’s no foreplay, so to speak. 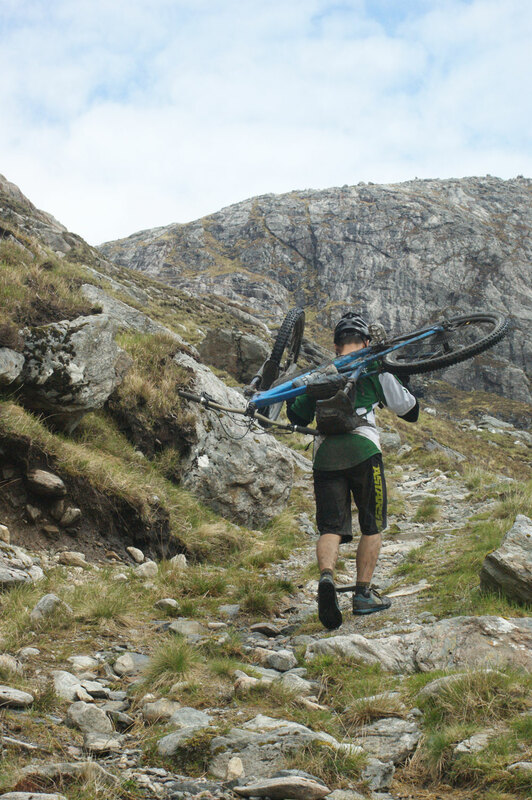 You don’t find yourself crawling up interminable fire roads or skirting around livestock in boring grassy fields, instead it’s usually nice rocky singletrack as soon as you head off the tarmac. And this was the case today as we hefted our bikes over a deer gate and immediately found ourselves tackling a tricky few kilometres of gradually-rising trail. However just as it felt like we were starting to get out into the wild, we dropped down from the open hillside to a farm – complete with yappy dog and cow pat-strewn field. After this we found ourselves on a very muddy track through some woodland, making slow and frustrating progress as I began to wonder if there was a good reason this wasn’t a well-known route. After an awakward and muddy start we were glad to hit the open hills. Fortunately we soon left the trees and mud behind as we crossed onto the open hillside, gradually gaining height as we pedalled eastwards up towards a plateau on a well-made rocky track. 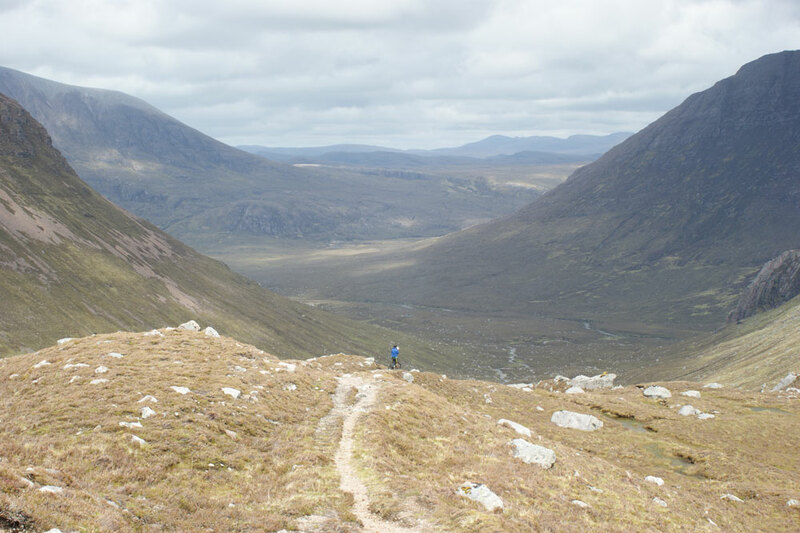 It still wasn’t exactly feeling like the wilderness, but it was nice to tick off some easy kilometres on the pleasant trail – which meandered through a landscape of small and medium-sized hills with the distinctive steep sides and ridge tops of this part of the North West Highlands. 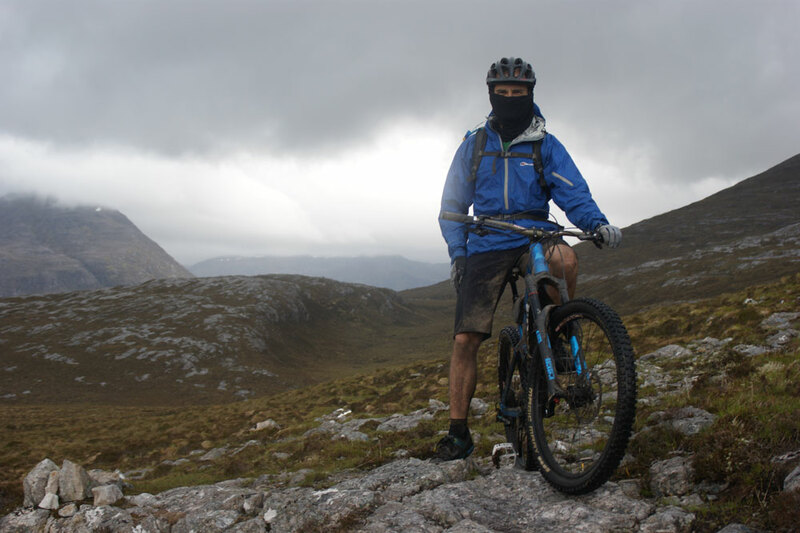 As we crested the plateau there was finally a feeling of being “out there”, and we were surprised to cross paths with another biker and a couple of walkers having a little explore up from Poolewe – before heading back the same way. Reaching the end of the plateau, the scenery switched from rugged to properly epic – with the huge Fionn Loch below us and some hefty mountains sitting behind it. This must be the “wilderness” then? Err, no actually. We needed to head down and cross the loch before tackling a picture-perfect pass snaking its way up the hill to the high plateau beyond. On the beach, Chris Rea not pictured. 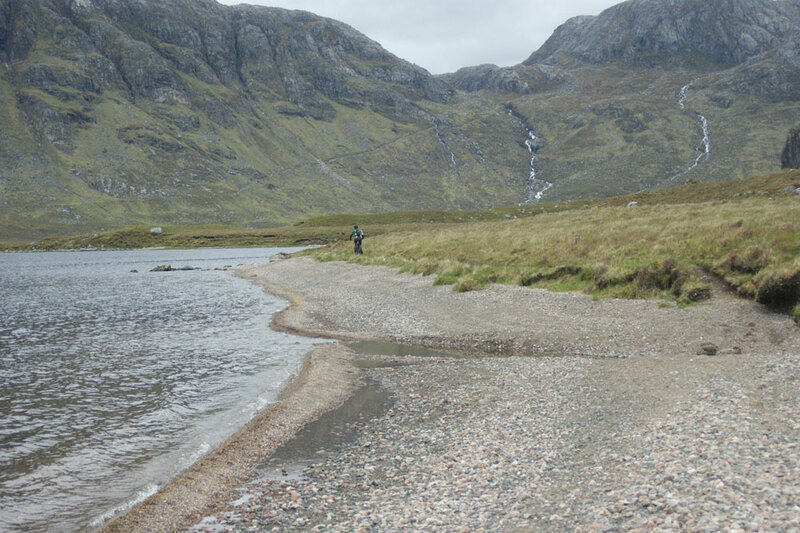 The track which snaked its way down to the loch was involving enough to be fun and spat us out on a miniature beach beside the water, which was bridged by a stone causeway leading to the pass ahead. Stopping for a bite to eat and some photos, we were making good time and feeling good about having covered almost half our planned distance in just a few hours. But of course some kilometres are harder won than others when you’re in the mountains – and we were only vaguely aware that the hardest sections of the route by a long stretch were still in front of us. Looks inviting, but it was pretty steep. So it wasn’t long before we were carrying. The pass was relatively easy, with a token pedal at the start before we settled for pushing and just a bit of bike portage. Reaching the top I must have subconsciously expected to be confronted with a dramatic vista like something from a Jules Verne novel, because I found myself slightly disappointed to actually just see a plateau of rocky outcrops and more tussocky vegetation. So this was the “great wilderness”, eh? Well it’s not bad I suppose. 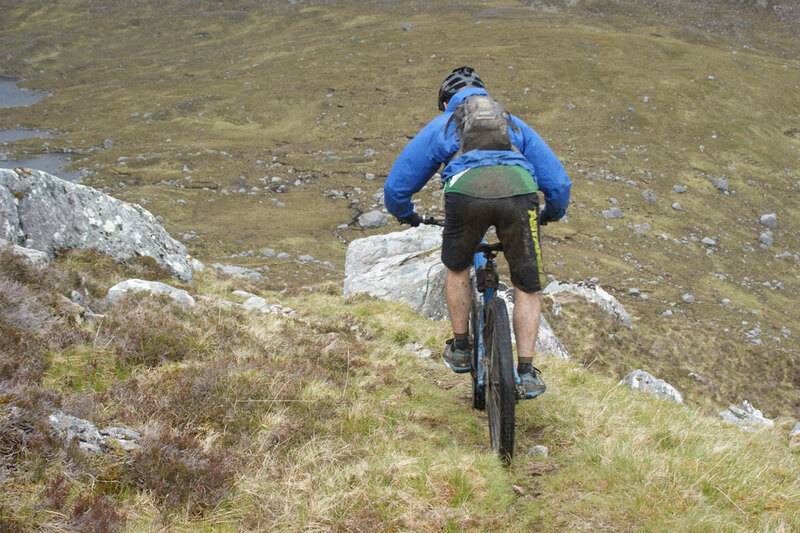 We settled into a nice bit of pedalling across the plateau on the pleasant high-mountain singletrack – which reminded me of the kind of Alpine tracks which tend to be labelled “backcountry” these days. And it wasn’t long before I was forced to retract my unspoken words of disappointment, as An Teallach loomed ahead of us, framed by the elegantly curved flank of Beinn a Chlaidheimh to the right. It was a little bit epic, yeah. Of course getting out under your own power in such stunning and sparsely travelled scenery is reward enough, but it didn’t hurt that the ride also included an epic 400m vertical descent that was more reminiscent of the French Alps than most UK trails. Rolling off of the plateau, things got steep and technical almost immediately, with a reasonable dose of exposure as we picked our way down the rock-strewn trail and negotiated a series of satisfying switchbacks which were just the right side of rideable. The photo doesn’t quite convey the exposure here. There was quite a lot of it. After burning off the first half of the altitude quickly, the trail gradually slackened out to become a fast but still technical singletrack trail which demanded a bit of pedalling now and then to stay up to speed. Just my cup of tea really – so we were giddy with excitement as the trail finally flattened out and tucked itself in beside a small river in the bottom of this ancient valley. The descent was so great that we weren’t too bothered when it turned into a bog. Progress beside the river was slow, as there were numerous boggy patches and the trail was awkwardly rutted – but we could already see the river plain ahead of us and as the trail finally petered out entirely it didn’t really look that far to the other side, where we would pick up another trail to the bothy below An Teallach. We actually managed to take about half an hour to travel less than 500m, but in our defence we managed to make a few wrong turns on the boggy, featureless plain – ending up backtracking to avoid impassable sections. The river crossing was almost an anti-climax, being shallow and slow-flowing. The actual river crossing was only knee-deep and while the current was brisk in the middle, we were never in danger of being swept away. I even volunteered to go in for a second dip so Chris could get some photos. Soggy feet after the river crossing. Reaching the path on the opposite side of the valley, we traversed north east for a bit before reaching the well-kept bothy and stopping for a well-earned energy bar. 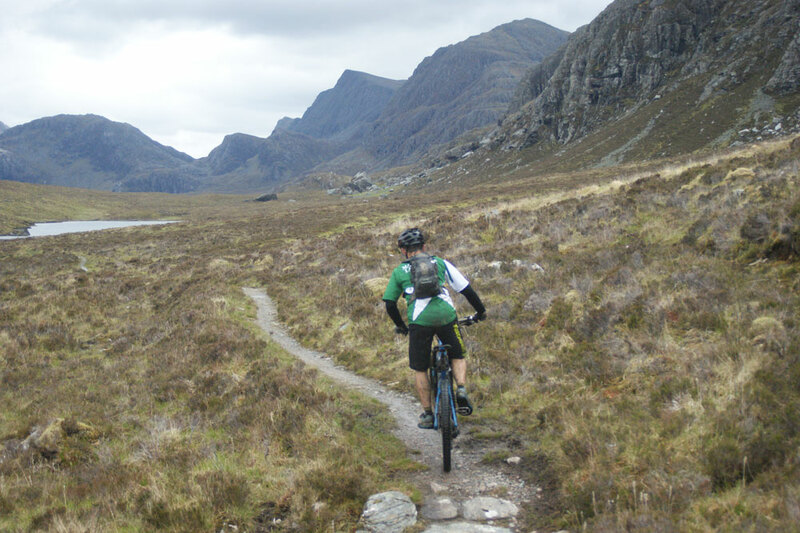 It felt like the final climb was a mere formality – and Chris had described it as a “short hike-a-bike” – so I was in the kind of elated mood that I tend to experience when I take on a big ride and find it comfortably within my abilities. However it turns out this was a bit premature. 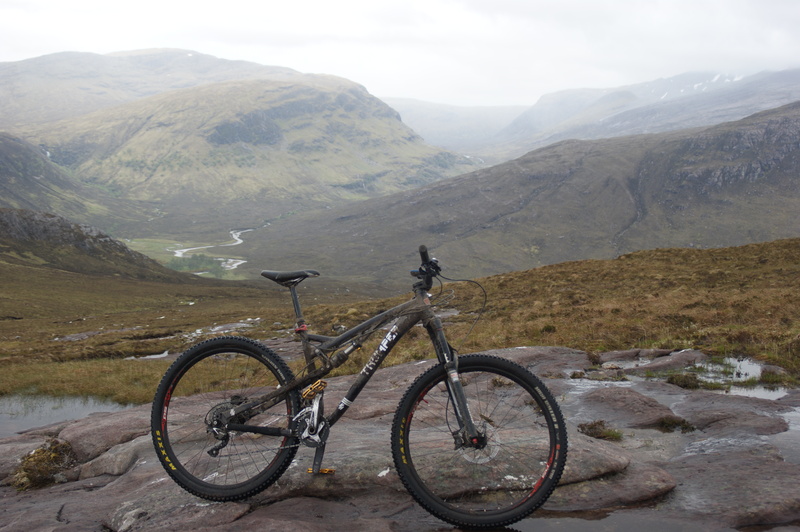 A nice bit of singletrack before the hellish slog up An Teallach. Now don’t get me wrong here, I don’t mind a bit of hike-a-bike. In fact I’ve come to prefer it to pedalling in some situations where you just want to gain the height quickly and get to the next descent. 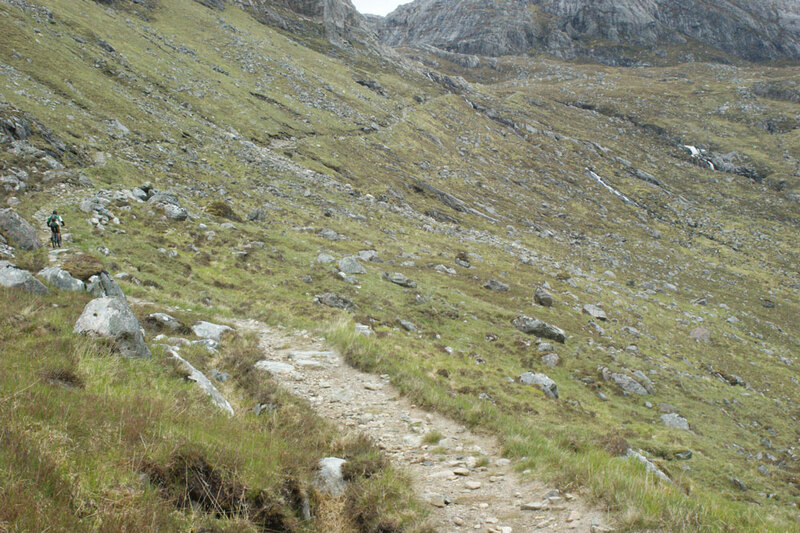 However I did not enjoy the climb up and over the eastern shoulder of An Teallach. This is mainly because the path seemed to alternate between being rocky and awkward or having super-slippery patches of peat waiting to put me on the floor. I don’t often get angry during rides, but I found my frustration levels rising from mildly miffed but still smiling to swearing at bits of dirt within the space of about 100 vertical metres. The Thumper took it all in its stride, unlike the rider. And unfortunately there was still another 200m to climb at that point, so there was still plenty of cursing to come. 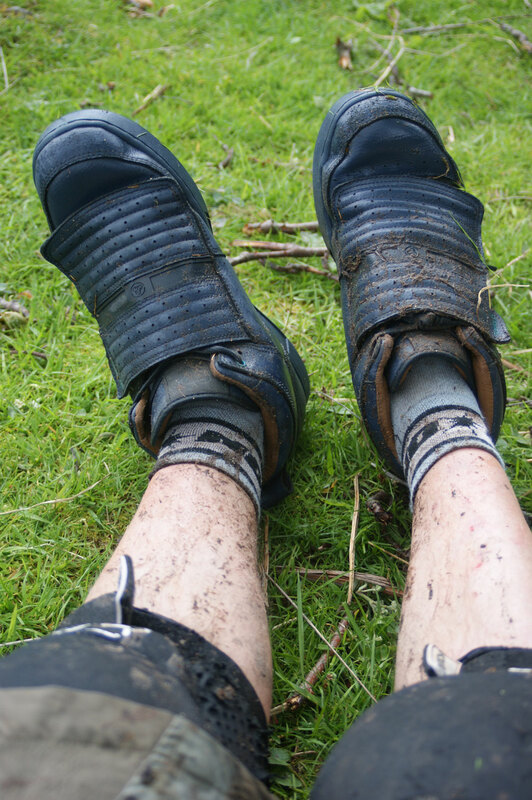 As the slippy peat gave way to a more slightly firmer trail the going got a little quicker, and the focus of my frustrations switched to the frankly ridiculous number of false summits. The first couple I found easy enough to take in my stride, it’s only to be expected after all. The next few got me a bit more wound up, was this hill taking the piss or something? But as the false crests just kept on coming, each revealing a further, lengthy section of uphill leading to another apparent “summit”, I had to make a conscious decision to embrace the absurdity of it all – if only to prevent myself from having a meltdown and hurling my bike off into the heather. Wary of my frustration over the climb – Chris tried in vain to disguise himself. Fortunately I had enough gels left to keep my flagging energy levels up – and started consuming these at the recommended 20 minute intervals (which nobody ever usually does, do they?). The light had dropped now as the clouds got lower (or were we just going higher) and I had to take care not to ignore the rugged majesty of this ancient scenery as I focused on putting one foot in front of the other. When I eventually caught up with Chris at the top of the pass he confessed that it had been a slightly longer climb than he’d remembered – and I was so happy that we only had downhill to come that I didn’t even both with my planned recriminations. The last downhill was not in anywhere near the same league as the previous one, basically being a Land Rover track that descended back to the road at Dundonnell. Fortunately it was a bit more rugged than the typical vehicular access track and the fact that there was more than 300 vertical metres of it with a few nice corners meant that we could really open up the throttle and look for interesting lines as we raced down it. It was a fun way to wrap up the day’s riding and put a smile back on our faces after that horrorshow of a climb. Reaching the end around seven or eight hours after we’d set off (five and a half hours moving time, fact fans), we felt the satisfaction of a good job, well done. It hadn’t been the most technical ride ever, it hadn’t been the longest or the hardest – but it had managed to feel like a lot more than its 40km length and 1,240m total ascent. We could confidently file this one under “epic”. Our happiness at finishing was only mildly tempered by the swarm of midges that suddenly emerged to try to eat us as we changed for the onward journey. By the way – I never did see that eagle again, but I’m willing to bet that she saw us. And probably heard my swearing too. I think the term ’empty lands” is more apt than wilderness. There used to be a considerable population living off those hills before they were forcibly removed, so it’s really not a wilderness. It has had considerable human impact before clearance and since. Most empty land is managed for sport and forestry, so there’s a not too obvious hand at work on maintaining that appearance.